I hate it when life gets in the way of blogging – hence why my posts are less frequent, and my visits elsewhere have been horrible. Sky: The Musical is over – and participants have come through in flying colors. A tip of the cap to all who took us on a 5-act musical journey across the sky and clouds to the sun, moon stars. No Explore post this weekend because the my 2016 Holiday Blog Party is the entire weekend. Start time is 1:30 AM (Eastern US), thus the gifts will be available for the European morning and even the late-night Friday crowd on the US west coast. Because of my lack of presence over the past few weeks, I’m expecting a smaller crowd than normal. 😦 … nonetheless, I will enjoy the company! Bring your friends. Bomb threats at schools have recently made the news – which reminded me of a Darwin Award candidate. It was probably in the 1980s, a person called the principal during school hours to issue a bomb threat. The principal asked the caller, “Who is this?” … and the caller gave his name – yes, a current student. Prior to the last debate Sen. Marco Rubio (R-FL) reminded everyone that one of the commonalities all the GOP candidates have in common is that none of them are Socialists. Former Governor Mike Huckabee (R-AR) also made the point during the debate. Even though all the candidates want to overturn the Affordable Care Act, none of them are against defunding public education, public schools, Social Security, Medicare, Medicaid, Unemployment Insurance, and other programs grounded in Socialism. A reminder for the Democrats who may have a burr in their shorts about Donald Trump (R-NY). The Republican nomination process requires 1,236 delegate votes to win the nomination – and at this point, all candidates have zero candidates … plus the process involves proportional allocation. For those wondering about a brokered Republican convention, it’s possible – but today is also too early in the process. However, it that happens, remember this name – Mitt Romney. The next Democratic debate is this Saturday night on ABC … and I won’t be watching. To lead you into a bit of satire, here’s The Onion’s review of the latest Star Wars movie. Here are multiple tunes to send you into the weekend. The first is a leftover from Act 5 that is also a shout-out to Cynthia because I think she’ll enjoy the song, the singer, and the video. The second is also a leftover that I enjoy. The last song title serves as a bit of advise for those dealing with the holiday crazies. Have a safe weekend and in the words of Garrison Keillor, Be well, do good work, and keep in touch … and I hope to see you at the party this weekend! On the topic of fact checks, one of Sen. Mitch McConnell’s (R-KY) ads mentions a factcheck regarding his opponent. Interestingly, Sen. McConnell’s has claims don’t clear the same bar. Not surprisingly to me, the Cincinnati Enquirer endorsed Sen. McConnell for the contested Senate seat. However, and sad to say, the last sentence in the endorsement caused me to laugh: We (the editorial board) just hope that, if re-elected, McConnell will remember that’s it’s Kentuckians first – not his party – whom he answers to first. I find this scenario interesting: What if the Republicans gain control of the Senate, but their leader loses his re-election? Mitt Romney says a GOP-controlled Senate would end gridlock in Washington. Sorry Mitt, I disagree. Did your Civics class leave out the White House’s role in legislation? Last week I asked instead of disposing all four of the top Congressional leaders (Reid, McConnell, Boehner, Pelosi), and if you could keep just one, who would it be? … and who do you think I would keep. Surprise … for me it would be John Boehner (R-OH). Although he has to deal with a difficult caucus within his own party, as an individual, I believe he would be the one most willing to make a deal. Shift college programs to 3 years? Happy Halloween. Here’s an interesting read wondering if adults have hijacked Halloween. Congratulations to the San Francisco Giants for winning baseball’s World Series … and special congrats to their fans who visit here that I know love their Giants … especially Lame and Amy. Pope Francis’ support (this week) for science regarding evolution and creation not only does not surprise me, but it continues a trend going back to Pope Pius XII. Regardless the clamor of the noisy cranks, there is no question in my mind that when measured along denominational lines, this is the predominant view among Christians. Even in that light, much of the Atheist community is not willing to join in partnership against the conservative agenda of placing God-driven creationism based on Genesis in public schools. To go along with the previous comment, I’ve been saving this one from Pew Research about attitudes about evolution by political party. Dr. John Walton is a professor of Old Testament at Wheaton College. (I loved his book about Genesis that I reviewed here.) Recently, I read this worthy essay about right vs. wrong … and I think agree vs. disagree is also valid. I continue to find a wonderful interest in Cynthia’s poems, Her audio versions add to my experience because she has an outstanding cadence. If you visit and comment, tell her I sent you … and a special thanks to Mary for directing me to Cynthia. Lauren Hill, the college freshman from the Cincinnati area with an inoperable brain, is expected not to see 2016, yet this Sunday she will get her dream of playing in a college basketball game. It seems that various cable stations will be broadcasting the game in different parts of the country. I’m curious if this makes the local news (television, radio, or newspaper) in your area … so let me know. Here’s an article about her. PS: I’ve learned that she will be in the starting lineup, plus the last player introduced. Cheers to everyone’s effort in yesterday’s Act 11 of Life: The Musical. In the history of musicals here, readers provided many songs that I didn’t know … and as one who appreciates a wide-variety of music, I say Many thanks! This blog hit the 200,000 hits mark late Wednesday morning. Unfortunately, I didn’t see the rollover, but my guess the celebratory moment occurred sometime between 11:40-11:55 AM (Eastern US). No Saturday Morning Cartoon this week because tomorrow is a special day! Do you remember why? Here’s another 2-fer to send you into the weekend. With Saturday being Sadie Hawkins Day, the first takes you back to 1959 with Stubby Kaye in Lil Abner. If musicals of that era aren’t your thing, you are only going back to 1980 for Turn It On Again (Genesis). Have a safe weekend and in the words of Garrison Keillor, Be well, do good work, and keep in touch. The Cincinnati Enquirer hosted a foreign reporter for 10 days regarding the election. During his time here, he attended local speeches by President Obama, Mitt Romney, and the First Lady. The article he wrote following the election is an interesting perspective. Because of where the reporter’s home and given the election results, the comments are also interesting. Meanwhile, those suffering from Election Distraught Syndrome are signing petitions to get their state to secede, which is the conservative equivalent of a losing liberal saying they are moving to Canada. I’m still waiting on the person to exercise their promise of saying they were moving out of the country if Barack Obama won in 2008. Of course, the people do forget they have the individual right to secede, which means move AND denounce your citizenship. On a similar theme, here’s an article about 6 bizarre election reactions. Gov. Romney’s recent account about blaming his loss serves as good evidence to support Peggy Noonan’s statement. Cheers to some as Gov. Jindal (R-LA) for saying something sensible. Thanksgiving is next week in America. My wine recommendations for the Thanksgiving meal are Pinot Noir, Riesling, and Gewürztraminer because the flavors from green beans, sweet potatoes, and cranberries screw up wine pairings for this feast. Cheers to my alma mater for making The Onion this week. For those noticing the nested dolls in the first St. Petersburg post, this one made me laugh – plus, it could be a potential holiday gift for the hard-to-buy-for person in your life. Thank you Viveka for this award! There will be a Saturday Morning Classic Cartoon post this weekend. Thomas Kemper Ginger Ale: Smooth; ginger tasting not overpowering, but enough to linger; not spicy; creamy quality with a hint of vanilla to me; honey is an ingredient – I like it! Blenheim Ginger Ale: With the initial taste, I thought sweetness with low ginger. The ginger taste is delayed and with a touch of spice – and lingered. Another good one! Here’s a touch of jazz to send you into the weekend. Well, handbells and chimes jazz with a light touch of drums. Believe it or not, it works! Have a good weekend! In the words of Garrison Keillor, Be well, do good work, and keep in touch. It’s finally here – Election Day in the United States of America. 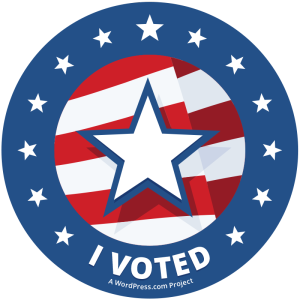 Many will go to the polls on Tuesday (including me), while many have already voted. Local board of elections will tally votes and declare winners – meanwhile, as winners cheer and mistakenly declare mandates, others will cry, feel remorse, and bitterly complain about something predictable. Three things have stuck me about the 2012 campaign. First, either it takes far too long or the candidates and parties have purposefully made it an agonizing process. Secondly, it is interesting how divided the American voters are these days. There is little doubt that Mitt Romney has not only repositioned himself throughout the election process – even contradicting himself on numerous occasions. Yet, many voters will ignore those missteps, not because they believe in Mitt Romney, but because they have a disdain for President Obama and Democrats. Thirdly, parties and the people representing them on the ballot are willing to pay an enormous price to get what they want – power! Typically in life, there is the price to pay dishonesty, misrepresentations, distortions – but not for politicians because it’s their way of life -and sadly, one that the people blindly accept. Columnists George Will compared this year’s campaign spending to the amount of money consumer giant Procter and Gamble’s (P&G) advertising expense. Once again, another bad example by Mr. Will as he tries to justify the benefits of the Supreme Court’s Citizens United ruling. I want to point out one big difference between product advertising and political ads: P&G is bound to the Federal Trade Commission guidelines stating that advertising claims must be true, non-deceptive, fair, and that advertisers must have evidence to support their claims. How many hungry would that money feed? How many clothes would that money help clothe? How many uninsured would become insured? How many jobs would it create through investments in companies for expansion? How many people could it educate? How many research grants could it fund? How many first responders could it rehire? How many shelters could it help? How much infrastructure could it improve? … And, this list can easily go on and on, which speaks volumes. Here are fact checks on the presidential town hall debate. Gotta love Greatsby’s notes through pictures of the recent presidential debate. I appreciate this bit of advice from Chris at Nachos Grande (who also happens to be the first person to comment on this blog): I won’t engage in political talks with people I don’t know. You can argue with buffoons and too many people who want to argue politics are buffoons – and from both sides of the political aisle. Is Learning a Product or Process? I just returned from a fun event playing night golf. Yep … the glow-in-the-dark ball, a glow stick on the flagstick and in the hole, my clubs, and a flashlight. Sometimes timing is everything. When I wrote and published yesterday’s Movember post about cancer and Proctober, I didn’t realize that I have an appointment on Friday at the urologist. Earlier this week I announced my candidacy for Worldly High President of the Not-Freshly Pressed Community (NFPC). Some wonder about the title. Any suggestions? This week I met my first blogger who happens to be a very loyal reader here. Thanks for the delightful day John Erickson! On my trip, I saw this office building approaching and drive by for the first time – the headquarters for Longaberger Baskets. A ginger ale update: I purchased more varieties and hope report next week. Meanwhile, Suranac Ginger Beer was on the smooth side and very balanced – thus bumps Hansen’s on advancing to the competition round. Sorry – but no classic cartoon post this Saturday morning. HOWEVER, I want to something, so I hope to have a light post for your weekend. Let’s go into the weekend with some class with the great voices of Katherine Jenkins and Placido Domingo Have a good weekend! In the words of Garrison Keillor, Be well, do good work, and keep in touch. Tuesday brings another presidential debate, which actually means more none answers and maneuvering the answer toward the scripted response. Unfortunately, because the event will not be using my rules, I doubt if I’ll watch. By the way, I’ll be making a special announcement during the debate, hopefully during the first 20-40 minutes! Before we get started, here are good resources to fact-check the VP candidates and their answers. I added another twist to this event with an independent Answer Rating Panel. Assuming I don’t banish the candidate to the Cone of Silence, each panelist will score the response from 1 (low) to 5 (high). However, the score is not if they agree/disagree, but how well the candidate answers the question. Given the rules, time will tell if the panelist will get a chance to rate an answer. I diligently searched for independent minds to help inform American voters. Without any further adieu, here are your Answer Rating Panelists. 1) You have commonly referenced the United States being “On the road to Europe”. You have also mocked Europeans on numerous occasions by not waiting to drag America down to Europe’s standards Yet, when you were in Europe, we refused to answer what you meant by that and other similar comments. What’s good about Europe? 2) Given your statements on Afghanistan, what is the difference between your plan and the president’s? 3) How would you respond if Germany wanted to have a military base in the U.S.? 4) Forbid this would happen, but here’s a scenario. The U.S. military enters a new military conflict in country XYZ. Would your administration finance the operation on or off the books? 6) Your tax cuts cost money. Your expansion in military spending costs money. Meanwhile, cutting funding to PBS and Planned Parenthood doesn’t put a dent in financing those ideas. You mention closing loopholes. In order to help the American people understand your position, I gave you a checklist of deductions and loopholes for individuals so you can check Yes or No regarding whether you favor or against removing this item. Let’s now show how you answered. 7) This is about the campaign. You accused the Obama campaign about its dishonest, deceptive, divisive, distorted, misleading, and out-of context information. Please give 3 examples of this. By making the previous accusation and supporting it with examples, are you also saying your campaign has not used dishonest, deceptive, divisive, distorted, misleading, and out-of-context information? So, are you also saying that the independent fact-checking reports have not been truthful with their findings? 8) You previously stated, “The president has to spend three years working in business before he becomes president of the United States. Then he or she would understand that the policies they are putting into place have to encourage small business to grow.” Does your running mate meet these qualification? 9) Instead of the government bailout, you favored the banks helping the auto industry. What would you have done if the banks, for whatever reason, decided not to help the auto companies? 1) In your 2008 campaign, you strongly wanted to close Gitmo, and one of your first year acts was to start the closing process. Because Gitmo is still open, how did you underestimate the process? 2) How would you respond if Great Britain wanted to have a military base in the US? 3) Tax increases seem to be the focus of your plan to increase revenues. Respond to the nonpartisan economists that mention the additional need for other revenue streams. 4) In terms of federal revenues as a share of GDP, additional taxes from those making more than $250,000 is only a small revenue stream. With that in mind, how do you propose to increase federal revenue? 5) Congress enacted and you signed Dodd-Frank to tighten up the financial sector. Why was this needed because the actions from the industry were legal. After all, the Justice Department has did not prosecute anyone involved in the financial collapse. 6) Many voters want bipartisan cooperation. During your term to date, was your biggest mistake why this did not happen? 7) Should the U.S. Supreme have another independent swing-vote justice? 8) In order to increase the supply of doctors, should the U.S. encourage immigration of doctors? 9) With America greatly reducing pollution in the past 50+ years, should Americans face a carbon tax while the greatest polluters today are in other countries? 10) Who made the decision to have someone tickle VP Biden’s feet during his debate with Rep. Ryan?